A youth soccer referee who is fed up with parent misbehavior on the sidelines has decided to shame them by posting videos of their antics online. 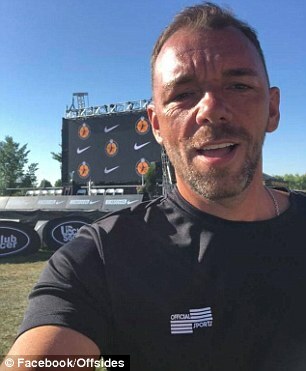 Brian Barlow, 44, has been a youth league referee in Tulsa, Oklahoma for 14 years, and finally became so fed up with outrageous parent behavior that he launched a Facebook page called Offside to shame them. 'I do it to hold people accountable — to identify and call out the small percentage of parents who nonetheless create a toxic environment at youth sports,' Barlow, told the New York Times in an article published on Wednesday. Soliciting videos from across the country, Barlow offers to pay a $100 bounty if he decides to publish a submitted video. Barlow calls the worst offenders - the screamers, abusers and brawlers - 'cheeseburgers'. Barlow, who works in marketing, says that the videos have had a positive effect on some parents. One who was caught acting out even reformed so much that she decided to become a referee herself. But for some rage-a-holics, the public shaming doesn't seem to spur self-reflection.